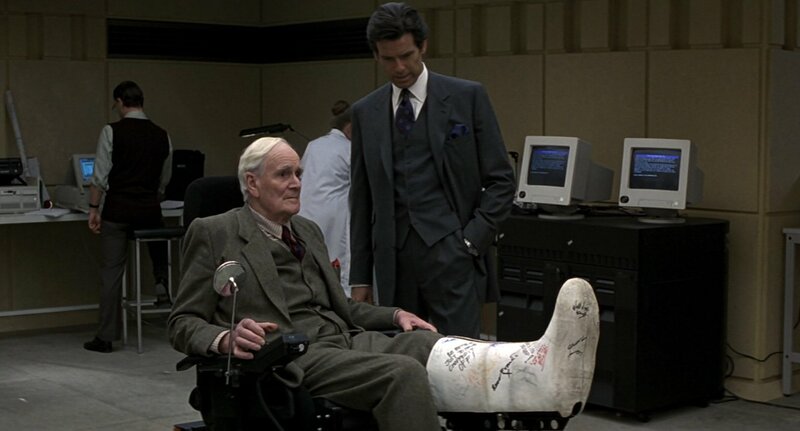 For GoldenEye, costume designer Lindy Hemming commissioned three different three-piece suits—plus plenty of extras—from Brioni. But only one suit’s waistcoat made it into the film, and that suit is the charcoal grey one with a blue windowpane. The charcoal ground is slightly iridescent, containing threads in differing shades of grey with hints of purple. The windowpane suit is not a very common one, and it’s most often seen in more rustic cloths or as part of a Prince of Wales check. But a windowpane on a city suit is quite elegant, and Bond’s example subtly stands out amongst the more typical solids and stripes. This Brioni suit is made in their “Augusto” model with their typical straight shoulder, and like Brosnan’s other suits in GoldenEye it is slightly tapered through the body and has a low button stance. The suit buttons three and has four buttons on the cuffs, double vents and slanted pockets with a ticket pocket. The latter two add an Anglicised flair to the 1990’s Italian cut to create an almost timeless look. The suit’s trousers have double reverse pleats and turn-ups. The waistcoat buttons six. Brosnan wears two shirt with this suit: an ivory shirt in London and a french blue shirt in Saint Petersburg. 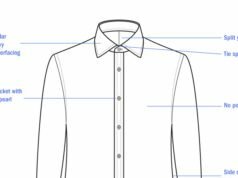 The french blue shirt, which was very popular in the 1990s, has a semi-solid appearance that suggests an end-on-end weave. The shirts are made by Sulka and have a moderate spread collar, placket front and double cuffs. The same tie is worn with the two shirt. The tie is a grid pattern of red, cream and yellow on a dark blue ground and outlined in black. A puffed silk handkerchief in the breast pocket coordinated with the blue ground of the tie. That tie on the other hand… well. 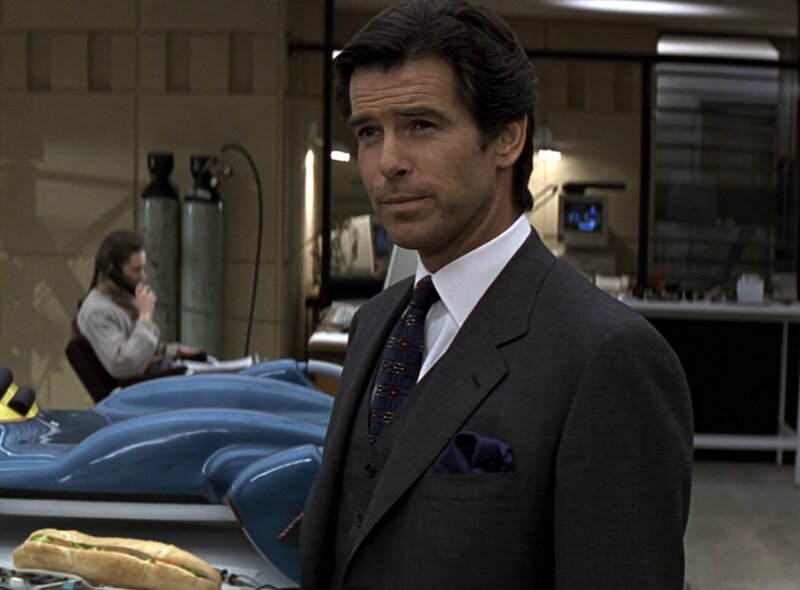 Most of the ties Hemming chose took Brosnan from secret agent with good taste to stereotypical car salesman. A shame. I still fail to see what was so wrong with Brosnan’s ties; they matched his high contrast complexion and were certainly more interesting than the current “minimalist” ties which might as well not be there. Is hating on Brosnan’s ties the current version of hating on Roger Moore’s safari jackets? Some of Brosnan’s ties I think look dated, but this one here I think is really nice. It’s not as bold as the one worn with the blue suit. I think the tie that was sold in the Bonhams lot was awful. I was at Bonhams on one of the viewing days of this auction in March 2007 and took a couple of pictures of this suit which shows the pattern a bit better. I can send these to you if you are interested. It would be great if you can send me pictures. My email can be found in the sidebar. Thanks! Perhaps, but “dated” is not synonymous with “unstylish” or even “unattractive” – the suits worn by Cary Grant or Gary Cooper in their heyday might look” dated” to our eyes, but they are vastly better in every respect than today’s “shrunken look”. I agree that London tailors would be unable to accomodate the needs of the film. I also think that the producers (in the most recent films) have done their best to adhere to the spirit of Fleming’s Bond and I commend their effort. But excessive homage to Fleming’s Bond, or even Connery’s, is inadvisable for he is a largely a relic of a bygone era and not fit for modern times. Yes, I agree that the suits in Skyfall are too tight. But that is how people dress in 2012. I agree that Bond should be timeless to a point, but he is also a creature of his times. Lindy Hemming’s comment that Bond must be a global citizen rings true for me. People now often wear their suits closesly-fitted, but only on the runways do they wear suits as tight as Daniel Craig’s in Skyfall. Come to Scandinavia Matt, there you’ll see loads of young professionals wearing these types of ultra skinny suits. We call it the “Swedish look”, and particularly Swedish “fashion” brand Tiger sell a lot of these condom like suits. It is can look acceptable on the tall and thin, but here also the overweight middle aged have started wearing them, and that is a ghastly sight. Here in Los Angeles, the suits are worn too. My only issue with them is that they are too short. No, I simply believe they are ugly… ease up. Wonderful post and outfit, although a subtle glen plaid in grey-blue (like the North by Nortwest suit) could have been equally good. I don’t understand why everybody dislikes the Goldeneye tank tie ; to me, this tie is as luxurious but more flashy, and fortunately the waistcoat makes its presence less loud. It’s a shame that Brosnan seems to be wearing a belt under his vest… About the shirt, I hate to disagree with you Matt, but isn’t the colour of the shirt a little darker, like a medium or even close to a French blue ? It reminds me a little the colour of Borsnan’s shirt in Bilbao in TWINE. I was waiting for a review of this outfit. The handkerchief is perfectly puffed, i like the tie aswell. I’ve seen that red, navy, cream green tie you say in some sort of promotional shots and photos, there is one that shows Bond wearing that tie with this same suit and shirt, with the aston martin in the back. As you say that tie is awful, is the only Brosnan tie that i don’t like, glad it didnt make it into the movie. In all seriousness, that tie wasn’t to my taste in 1994 or today – I’m not a fan of abstract patterns like that because they were so widely pushed by cheap vendors such as Tie Rack and BHS and will, for me, always bring to mind the dreaded pre-packed ‘shirt and tie in one packet’ offerings from these stores. 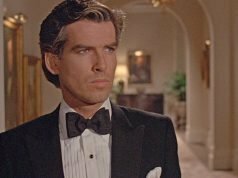 But Brosnan gave Bond a decidedly new style and even though I’m not a fan of much of the neck wear I respect and admire that. And the suit is a thing of beauty. 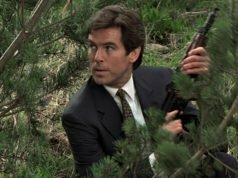 Brosnan’s ties are like the MWTGG plaid jacket – even if you don’t like that sort of thing, you can admire it… and both are a world away from these children’s suits Daniel Craig keeps squeezing into! I forgot to ask: What about the overcoat bond wears over this suit? ist it black or navy? details? There are very few things that I don’t like about Brosnan’s suits (surprise surprise!) One is his penchant for wearing belts with three-piece suits as seen here. However I’ll forgive this in Goldeneye since the belt incorporated a clever Q gadget. At lease they decided to forgo the waistcoat with the navy birdseye; I think that would’ve made the belt piton gun scene a little awkward. Even with some of the tailoring details of the time– low button stance, longer coat, and wider trousers, this suit doesn’t scream 1990’s, and though it wouldn’t be at the height of “fashion” today would look absolutely appropriate on a well-dressed businessman. The English details like the ticket pocket create a nice harmony of styles. I also like this tie, I’m glad they stuck with this one for both uses and didn’t use the other one from the publicity stills. That was a bit much! Great post, big fan overall. Kyle, you can blame Lindy Hemming for the belted three piece suits. She did the same thing with Daniel Craig at the end of “Casino Royale”. At least Jany Temime had Mallory wearing braces, even if the suits for Bond himself were underwhelming. Can anyone post the URL for these infamous publicity stills? I think “silk effect” is the auction’s way of describe Bemberg. I asked my tailor if it would be possible for Thom Sweeney to dress Bond in future films, and was told that’s highly unlikely. Tom Ford’s company paid over one million dollars in endorsement fees to be the dresser for Bond. Also, since Bond is now more of an action character than the gentleman spy, a huge amount of suits need to be made for filming. According to my tailor, that’s difficult for Thom Sweeney and other London tailors to handle. However, I wonder if large design houses like Burberry or Dunhill can take the mantle in dressing Bond in future films. See, that’s what I’m saying. I find it hard to believe that they can’t go with a British brand like Burberry at the very least. Certainly, their suit style is English enough and they can mass produce in enough numbers for action scenes. I also never got the point of endorsement fees from Brioni and Tom Ford. Exactly who is going to know that those brands are in the movies besides people like us who search it out (more out of curiosity than a desire to own everything from the movies)? You can maybe see the Brioni label if you look for it in “Casino Royale”. Clothing brands that don’t have logos on them are not as immediately recognizable as Heineken, — which I was worried about given the TV spot for it, but was thankfully limited to a couple shots lasting maybe three seconds each. Does it really make that big an impact on sales, given the asking price for a ready-made suit (not even MTM or bespoke) from one of these brands and the average income of moviegoers? While it’s true that a number of English brands could handle the Bond series’ needs, they also have to be willing to provide the clothes for free. Given how large the budgets of these movies are, are that many suits really going to put that much a strain on production? If they can save half a million dollars I’m sure they won’t pass that up. I seem to recall a rumour circulating before production began on Quantum of Solace stating that Alfred Dunhill would be dressing Bond. Although I am not as critical of the Tom Ford suits as many on this site, I do believe a British brand such as Dunhill would be a better match for Bond.